Cycling Across Canada For a Good Cause! Jim Maxim is Windsor born, and has lived here his entire life. For 27 years he has been a member of the Windsor Fire Department where he is currently a Captain. Four years ago, Jim took up cycling, and has easily logged 100+ miles each trip he has taken. He has decided now to use his passion for riding to raise money for two local charities that are very close to Jim’s heart, The Heart Defects Society of Windsor and Essex County and the Windsor Spitfires Foundation. 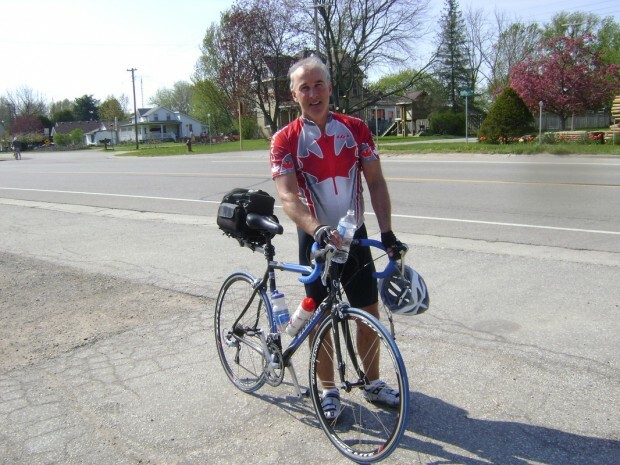 So, on May 29th, 2011 Jim will leave his Windsor home and begin his Cross Canada Conquest, each day cycling an average of 100 miles, or 162 km. To offset some of the expected costs of his charity cycle, there will be two fund raising events held. First, On Thursday at Koko Pellies in Downtown Windsor, there will be a night of music and drinks. The $5.00 cover at the door will be donated to support Jim’s ride. Second, on May 7th, the Hook & Ladder club will be hosting a pasts dinner. Tickets are only $ 15.00. You can contact them here for more information. windsoriteDOTca will be following Jim’s ride all summer long ad will have updates often!